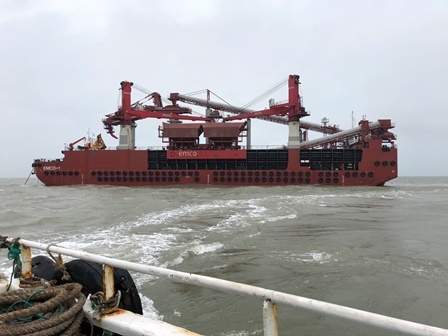 New offshore transshipment equipment has been put into operation at the port of Shakhtersk for handling of Panamax and Capesize ships. That will let increase coal transshipment almost two-fold. Andrey Mekhanikov, Vice-President, Stevedoring and Shipping, East Mining Company Ltd, tells IAA PortNews about this project. - Mr Mekhanikov, offshore transshipment of coal in Shakhtersk has been carried out for a long time already. Could you, please, tell, what is the purpose of transshipment equipment modernization? - Almost 80% of Sakhalin coal is produced by East Mining Company Ltd. The bulk of it is exported via the port of Shakhtersk and stevedoring company Coal Sea Port of Shakhtersk. The port has been initially carrying out offshore loading of 50,000-55,000 DWT bulk carriers equipped with cranes. 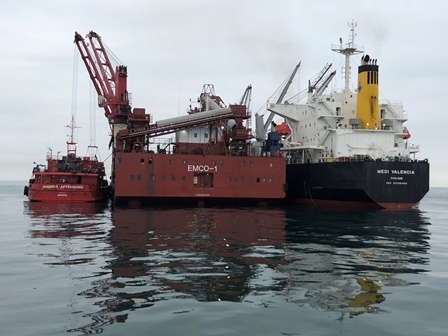 That let us show considerable growth of throughput: in 2016, coal shipments grew to 3.1 million tonnes, in 2017 – the growth continued to 4.5 million tonnes, in 2018 EMCO is expecting a substantial growth to 8 million tonnes. To ensure this surge we needed something more - qualitative change of the transshipment technology with a possibility to handle Panamax and Capesize ships, that lets enter new markets and reduce freight costs. We have studied international practices of operating such offshore transshipment facilities and compared economical efficiency of investments in construction of new hydraulic engineering structures for direct berth-to-ship coal transshipment with the projects on the development of offshore facilities. Apart from economic advantages, offshore facilities provide the investor with higher mobility and flexibility when it comes to application of technologies. Besides, and that is a top priority today, they minimize the impact on environment. That is why the company has opted for upgrading of its offshore facility. - The project was based on upgrading of the existing transshipment barge, wasn’t it? - In 2015, our company purchased a transshipment barge, EMCO-1 (ex. Bulk Irony), that was previously operating at the Italian port of Piombino. At that time the vessel could not be used for servicing of ships not equipped with cranes and we had to upgrade the newly acquired vessel. 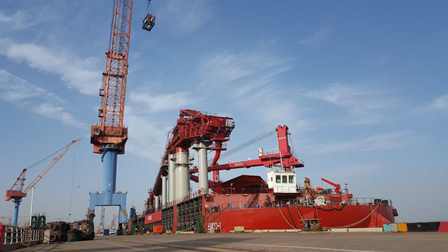 It was not hard to select a company for developing of the modernization project: the ship was designed by an Italian company Logmarin for an Italian operator of offshore facilities, Coeclerici. Therefore, the upgrading was designed Interprojetti, a partner of Logmarin on designing of transshipment equipment. When developing specifications, the customer - EMCO - took into consideration specific conditions of Shakhtersk port. The winner of the tender on equipment supply was Bedeschi. It should be noted that Bedeschi-Liebherr-Logmarin alliance is a leader in designing, construction and outfitting of transshipment barges, terminals and floating cranes. Cooperation with such an experienced company let us mitigate many of our risks. - What shipyard was entrusted to upgrade your vessel? How much time did it take? 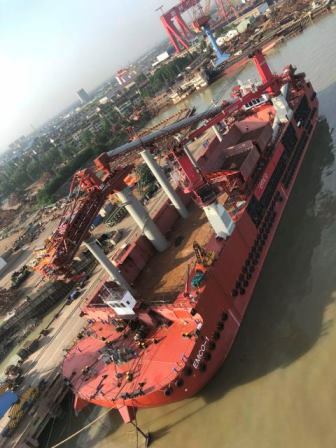 - In October 2017, EMCO-1 barge was arrived to Chengxi-Xinrong shipyard. The reconstruction took slightly more than half a year – on 30 May 2018 we took the delivery of the upgraded ship. The works included fitting the ship with new equipment, repair of the deck cranes, power plants, hull and accommodation decks. In early June 2018, the vessel started operation off the port of Shakhtersk. - How profitable is the scheme selected for cargo transshipment increase? - Investments into modernization totaled about EUR 9 million with the total cost of the project of some EUR 20 million. However, construction of new transshipment barge would cost at least EUR 20 million. It is an evident financial advantage. Besides, as I have told, we had decreased the impact on environment in the area where the settlement of Shakhtersk is located with the renouncement of a large scale industry construction in the near-shore zone. We have also minimized the impact of coal on the water area. The bunkers of the transshipment barge are equipped with special hydraulically-driven panels to prevent coal from falling into water during the transshipment process. EMCO has always been focused on environmental aspect when selecting technological solutions. Today, the company is working on the project of a 30-kilometer conveyor for coal to be delivered from the coal field to the port. It will let avoid using trucks and drastically improve ecological situation in the area. Besides, highway repair costs will decrease considerably. - You have been supervising EMCO project from the idea and throughout its implementation. Your personal experience of port management in 2013-2014 has certainly helped, hasn’t it? - Of course, I have used all my knowledge and expertise. But construction and commissioning of an offshore transshipment barge is a more interesting and unique experience in its own way. A large role was played here by a well coordinated work of our team – EMCO and Bedeschi Spa, a general contractor. It also should be noted that offshore transshipment barge is not the first construction project of the company. In 2017, we had six 500 DWT shuttle ships built in China to our individual project. Those small ships are being used for loading in the shallow-water part of the Shakhtersk port. - Do you think such a project can be implemented by a Russian shipyard involving local designers and supplies? - We would think like the efforts of the Government on the development of the Far East, revival of domestic shipbuilding and implementation of the Free Port of Vladivostok project will bring the results and our shipbuilders will be able to compete successfully in the market of the Asia Pacific Region. At least, it would be interesting to have a hull built at a local shipyard and be equipped there. As for production of sophisticated equipment, our manufacturers should, in my opinion, be focused on innovative projects, Arctic projects, where there is a possibility to fill a niche. In conventional market of handling equipment for ports and vessels, it is definitely not reasonable to compete with global leaders that have accumulated huge experience and competence and have certain specialization.